At the DLR annual reception in Brussels, from left to right: Karsten Lemmer, DLR Executive Board Member for Energy and Transport; Günther Oettinger, EU Commissioner for Budget and Human Resources; Rolf Henke, DLR Executive Board Member for Aeronautics Research and Uwe Möller, Head of the DLR Brussels office. Günther Oettinger, EU Commissioner for Budget and Human Resources, delivering his speech. 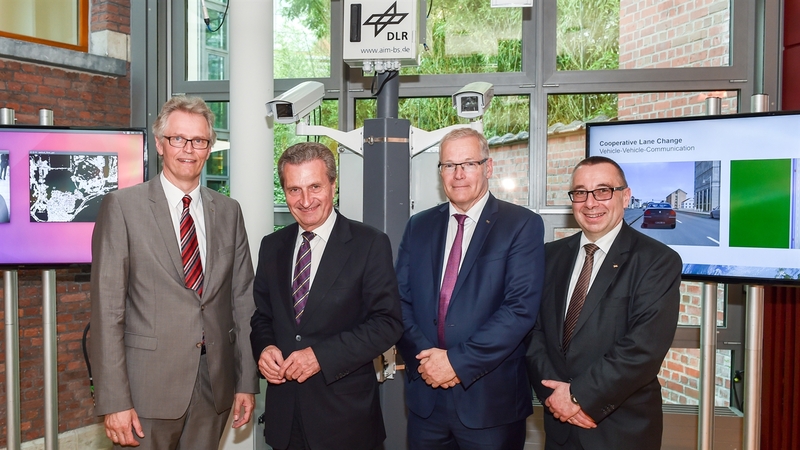 The 2018 DLR annual reception in Brussels took place in the Bavaria State Offices. Networked autonomous driving and flying will radically change transport as we know it today. Such technology has the potential to fundamentally improve our energy and emissions footprint, as well as to make transport safer and more efficient. Innovations in this area will be key across the whole of Europe and its various economic sectors in sustaining competitiveness with other major business locations worldwide, as well as in the effort to achieve a sustainable and climate-friendly economy. At this year's German Aerospace Center (Deutsches Zentrum für Luft- und Raumfahrt; DLR) annual reception at the Bavaria State Offices in Brussels, the potential of networked, autonomous transport and aviation to address the societal challenges of climate protection, ageing societies and increasing urbanisation were discussed in the presence of Günther Oettinger, the EU Commissioner for Budget and Human Resources. 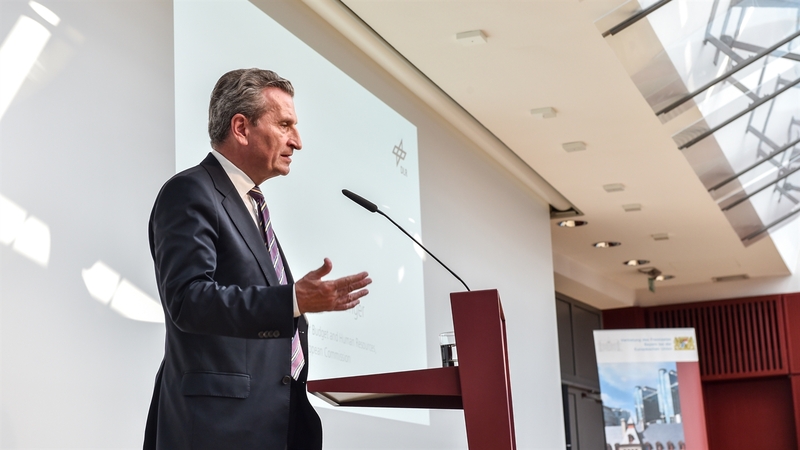 Commissioner Oettinger underlined the importance of technological research and its increasing emphasis within Europe, as research and innovation underpin the EU’s competitiveness. For more than 10 years, DLR has been a leading player – both nationally and Europe-wide – focusing its activities and research programmes on networked, autonomous mobility, and has contributed towards the development and design of future travel and freight transport by land, water and air. Research and development harness the possibilities of digitalisation for sustainable and efficient mobility. Above all, European policy is called upon to address the challenges posed by countless unresolved regulatory issues, in addition to securing research funding. "Many of our 8000 employees are conducting direct or indirect research into current issues and technologies relating to networked autonomous mobility," said Pascale Ehrenfreund, Chair of the DLR Executive Board, at the reception in Brussels. "The diverse scientific work conducted at DLR also benefits greatly from the synergies between our research areas and programmes in transport, aeronautics and space," continues Ehrenfreund. 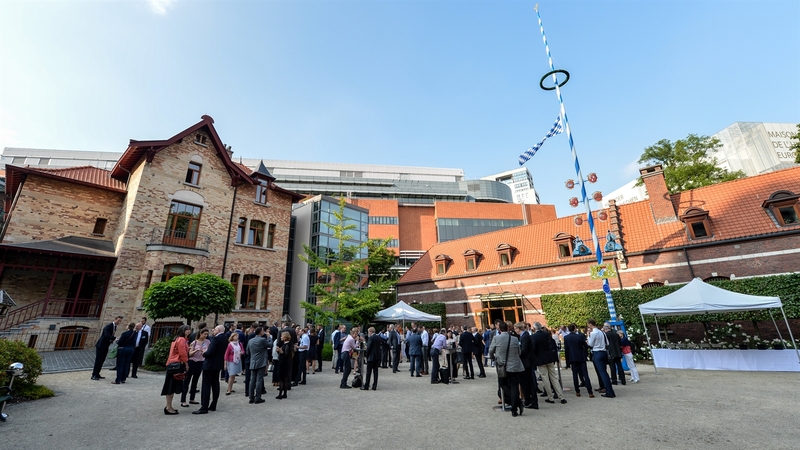 Speaking to around 240 invited guests at the Bavaria State Offices in Brussels, Karsten Lemmer, DLR Executive Board Member for Energy and Transport, stated that: "The decisive factor will be how we use and design automation for people's mobility in the future. Demand-based bus services, warning lights at intersections that make drivers aware of cyclists and using a tablet to steer cars are just a few examples of how our research work will pave the way for greater comfort, safety and freedom." DLR also has a leading position in the EU transport research programmes European Green Vehicle Initiative and Shift2Rail. During his speech, Rolf Henke, DLR Executive Board Member responsible for aeronautics, addressed the aspects and developments relating to the future of aviation: "We can only tackle cross-discipline research challenges such as sector-free airspace or laminar-flow technology for streamlined, efficient and climate-friendly aviation at a European level," said Henke in Brussels. He stressed the importance of European organisations and initiatives within the field of aeronautics research. These include the European ACARE (Advisory Council for Aviation Research and Innovation in Europe), in which DLR plays a leading role, and for which it produced a revised research and innovation agenda for European aeronautics last year. In addition, DLR is a key player in the Clean Sky 2 and SESAR 2020 programmes. DLR's space research area is also providing additional synergies for future mobility, particularly in the areas of global networking and navigation, with the largest DLR site in Oberpfaffenhofen, Bavaria, making particularly significant contributions. In addition, DLR's research is benefiting from cross-sectoral developments at the interface with its own work on digitalisation, as well as involvement in artificial intelligence.